Then baby, don't save me. 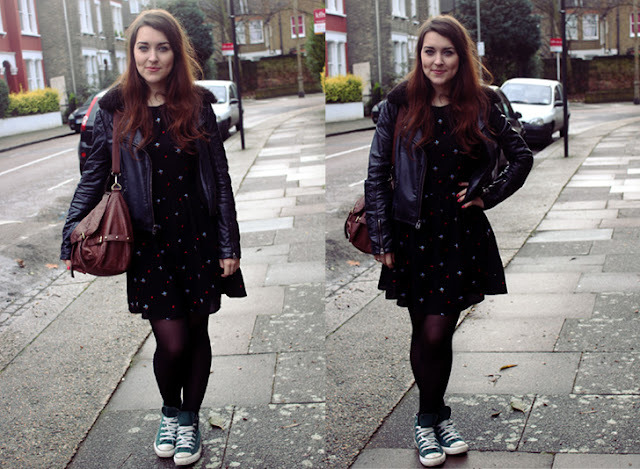 Converse - Office (these are old but you can get them here), Dress - Topshop, Jacket - Topshop (old, very similar here) and bag - Urban Outfitters. I decided to brave Oxford street on my day off with my mum to get a few last Christmas presents, and as I'm trying to do some more fashion related posts I thought I would show you what I wore. This is a pretty everyday outfit for me as I like to keep things simple and practically live in my Zara jeans. I brought this dress from Topshop during a 20% off student event they had a few months ago. I originally fell in love with the longer sleeved version of this but I couldn't find it in my size anywhere so I settled for this. I really love the tiny embroidered hearts and flowers on the dress, they really liven up the simple black dress. The dress itself is really flattering and I find that it because of it's length and shape it makes me appear slimmer than I actually am (which is always a bonus!) The only thing I would say is that for the price (£46.00) that the material is quite thin and there is no lining so the dress is a little see through, but it's nothing that a long vest or slip can't sort out. Anyway, I hope you enjoyed my second OOTD and please let me know if you would like me to do some more, as they're still pretty new and scary to me! I hope you're enjoying the holiday festivities and it's only 2 days until Christmas! I also recently joined Lookbook, so if you have an account I'd love it if you wanted to come take a look! You are smoking hot in that dress and those chucks! !